The AR-15 platform guns are among the most popular today's modern sporting rifles. One of the key components of the rifle is the buffer with its tube and spring, which as a unit serve a dual purpose. Let’s have a look at its function and how it can be improved upon with upgrades. The buffer tube forms a protrusion along the lower receiver and serves a dual function. It encapsulates the buffer with buffer spring (also called the action spring). It works as the attachment point for the buttstock, but also the recoil buffer in the buffer assembly is the contact point for the bolt carrier to move rearward. That makes it a crucial element for the AR’s cyclic action. After firing, the bolt carrier moves back into the buffer and the action spring recoils. It then pushes the buffer and bolt carrier forward, thus loading the next cartridge and closing the bolt for the next shot. Typically, a factory AR-15 will normally be a bit over-gassed by the manufacturer to ensure reliable function with various types of ammunition and operating conditions. However, the rifle builder can tune how the rifle cycles in two ways. One is adjusting the gas management by using an adjustable gas block or by adjusting the weight of the reciprocating mass - the buffer. 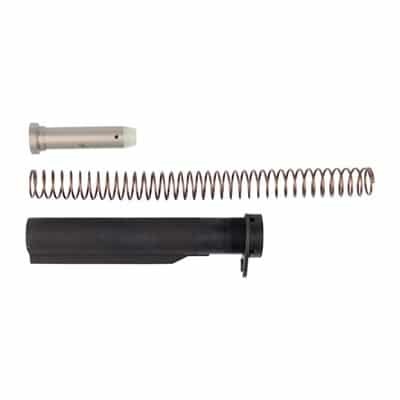 The buffer and spring are the only two mechanical parts that affect the rifle’s cycling and noticeably reduce the felt recoil. For the AR enthusiasts, it’s important to remember that rifle barrel length and weight directly relates to the buffer weight. In short, the lighter the barrel you have, the lighter the buffer you need to use. AR-15 buffers are available in a variety of weights and markings with heavier buffers for pistol-caliber carbines through rifle buffer models. They can weigh from about 3.0 ounces to around 5 ounces. Buffers may be made of lead or aluminum, but the most frequently used materials today are steel and tungsten because these materials are both heavy and dense. While steel weighs around 0.28 lb. per cubic inch (PCI) on average, a tungsten buffer commonly weighs about 0.70 pounds PCI on average. There are four basic configurations of AR buffers. Within these there are also a variety of buffer weights and designs available on the aftermarket. Here are some averages, but of course there are variances among manufacturers. The standard .223/5.56mm semi-auto only carbine buffer is usually unmarked. It consists of three steel weights and usually totals about 3.0 oz. in weight. The most common buffer, marked “H” for heavy, features a combination of one tungsten and two steel weights and commonly weighs around 3.8 oz. H2 buffers feature the same design as the H buffer. This version is better with heavy barrels since it weighs around 4.7 oz. on average. It is comprised of two tungsten + two steel weights inside the buffer. H3 is similar to the H and H2 but it was designed to work with longer and heavier barrels. The H3 buffer includes three tungsten weights and often weighs about 5.6 oz. Besides the weight, there are two different sizes of buffers - rifle length and carbine length. Another significant difference is the diameter of the area where the stock slides onto the tube. With the original Mil-Spec buffer tube the threads at the front are actually a larger diameter than the rest of the tube. Mil-Spec tubes are a forged, one-piece design with an outside diameter measuring 1.148". The threads on Mil-Spec buffer tube are rolled on. On the other hand, commercial-spec buffer tube threads are cut into the front end with a lathe just like any other threaded pipe. This allows for a lower manufacturing cost. 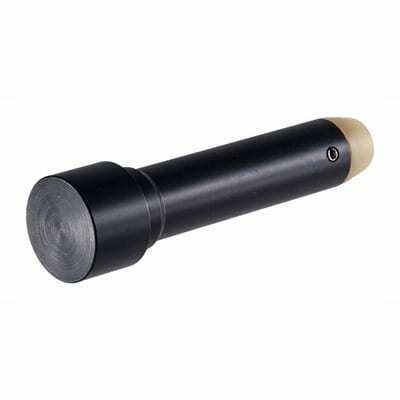 Since the commercial receiver extension tube is a touch larger in diameter, measuring 1.168", mil-spec and commercial versions are not compatible with each other. So stocks that fit one will not fit the other. There are no functional differences between the two. But the prevailing opinion is in favor of Mil-Spec buffer tubes for the simple reason that more stocks are available. We’ve explored a lot of buffers and here present you with some suggestions to avoid the hassles and to optimize the gas delivery on your custom rifle. Since the standard-diameter spring rubs the internal surface of the buffer tube, the Black Rifle is known to have a "twang" sound after firing a cartridge. This can be especially pronounced during shooting with a suppressor. If you want to avoid this “twang” effect, the solution is to use a JP Enterprises Silent Captured Spring AR-15 Buffer System. In this system, the buffer spring that does not contact the inside walls of the tube. The Gen 2 Drop-in captured-spring recoil system boasts an aluminum guide rod to reduce the unit’s overall weight. It also has highly-polished stainless steel parts, guaranteeing smooth and precise operation. It’s paired with a hard polymer nylon spacer that measures 1-5/8". The SCS smooths out the actual operation of the gun and minimizes bolt bounce. This results in sound reduction. The JP system seats the bolt much better and more consistently on the round, eliminating the friction of standard buffer components. This unit can be modified by changing out the spring or replacing the steel weights with tungsten for a heavier buffer. Combining the heavier buffer weight, spring tension and an adjustable gas block will help reduce the noise to a minimal amount. It will also help reduce the amount of pressure in the upper receiver. 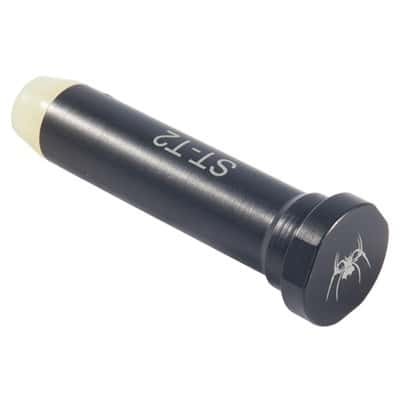 More importantly, the SCS is a self-contained unit that can be used in carbine- or rifle-length receiver extensions. It can also be used with short-barreled rifles (SBRs), suppressed weapons, select-fire ARs and piston-operated ARs. 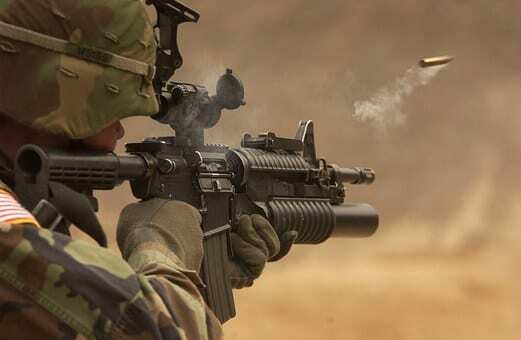 However, this system is not compatible with 9mm AR variant or any blowback system using a solid carrier. Another buffer assembly kit comes from a company with a well-deserved reputation for excellence. These are extremely popular among law enforcement officers, military personnel and shooting sports competitors. Bravo Company’s complete buffer kit consists of a Mil-Spec receiver extension (buffer tube), receiver end plate, M4 castle nut, carbine-action spring and carbine standard buffer assembly. The 6-position buffer tube is built to Mil-Spec dimensions from impact-extruded 7075-T6 aluminum. Also included is a standard 3 oz. (85g) carbine buffer, a carbine action spring and a castle nut made of high-tensile steel for improved strength and durability. There are a few issues about the finish not being perfect. Also, some buyers might hope for a sling mount rather than a standard plate, considering the brand and price range. 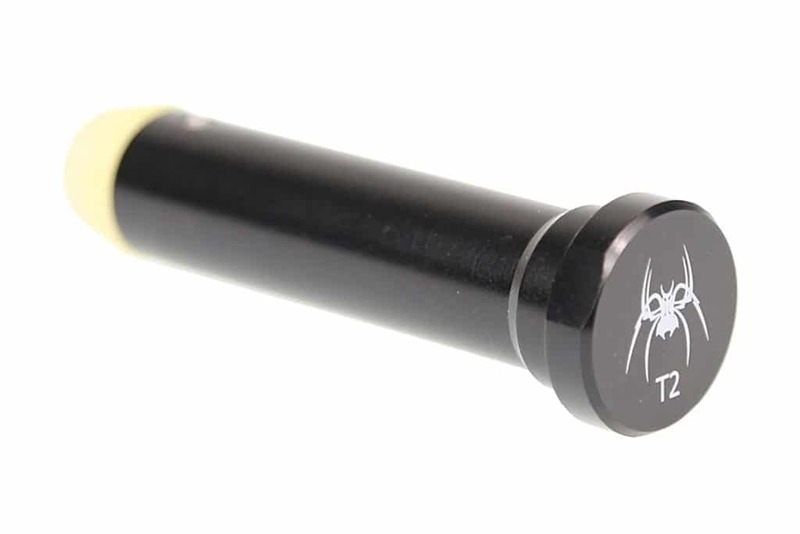 The Spike's AR-15 buffer tube is machined of durable 7075-T6 aluminum with a Type III hard anodized coating. The buffer springs are made of electro-polished 17-7 stainless steel designed to resist the binding that can occur with lower-quality springs. While these Mil-Spec springs are a very popular, the real favorite among gun aficionados is that this model is weighted with tungsten powder. The aluminum body measures 3¼" (8.2cm) long and is topped with a polyurethane bumper. The kit comes in three weights, all with tungsten powder to absorb the recoil efficiently and quietly. You can either select the standard-weight ST-T1 (3 oz.) buffer (LDTP) filled with low-density tungsten powder. The ST-T2 filled with high-density tungsten powder (HDTP) for extra weight (4.1 oz.). Finally, you can use ST-T3 filled with an ultra-dense tungsten bar that weighs 5.4 oz., giving you maximum recoil control in full-auto mode and on suppressed weapons. This unit is a purposefully assembled buffer kit that gives the best combination of recoil control and reliability in your carbine with an M4-type adjustable stock. With this AR manufacturer which creates high-quality parts, you can’t go wrong. The only negative would be that’s it only wrapped in a plastic bag without paper or bubble wrap to protect it in transport. 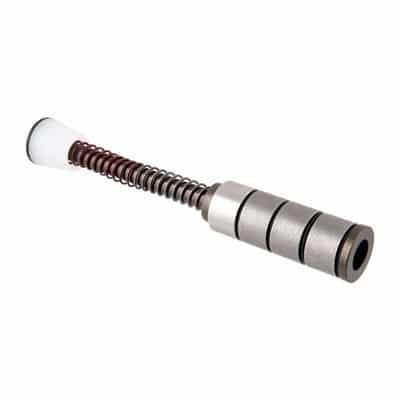 This Rock River Arms 9mm buffer is an essential piece if you want to convert your AR-15 to shoot 9mm and reduce the cycle rate and felt recoil of the AR-15. The RRA carbine buffer weighs approximately 5.6oz with a traditional length of 3.300″, like standard Colt 9mm buffers. It features steel construction, a polyurethane bumper and a phosphate finish. There are several side benefits to the Heavy Buffers 9mm Q Buffer. It offers a smoother function, less felt recoil and a reduced rate of fire. It uses the same buffer spring as .223/5.56 and is heavy enough to keep blowback gases to a minimum. The Rock River 9mm AR15 Buffer is a self-contained unit held together with very rugged roll pins. Some shooters hold that a 9mm buffer needs to be at least 3.6 inches long to prevent the bolt catch from breaking, so this unit comes up short there. This rifle buffer system from Bushmaster Firearms works with "rifle" receiver extensions (in other words, it will fit rifle-length buffer tubes). It weighs 5.4 oz., the equivalent of an H3. This steel construction has five steel weights and one spacer inside. It’s topped with polyurethane bumper. 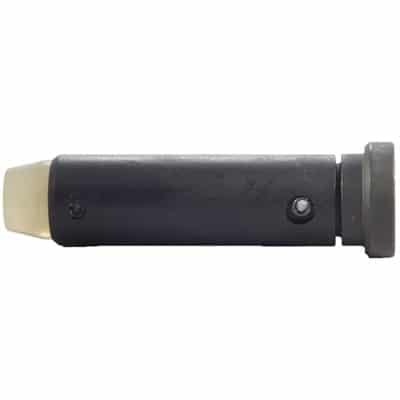 This simple rifle buffer is typically available in only one weight (around 5oz) and cannot be modified or adapted to different types of load or suppressors. This heavy buffer is fully compatible with any blowback 9mm upper receiver for true versatility on any number of your weapons, ensuring you can standardize your buffers throughout your arsenal. Finished with a special nitride melonite salt bath and QPQ, the heavy buffer is unique in offering lubricity and excellent wear-resistance for a long time to come, no matter how often or heavily you use your AR-15. At 6.4 ounces in weight, the FM Products heavy buffer provides a heavy-duty performance you can feel. 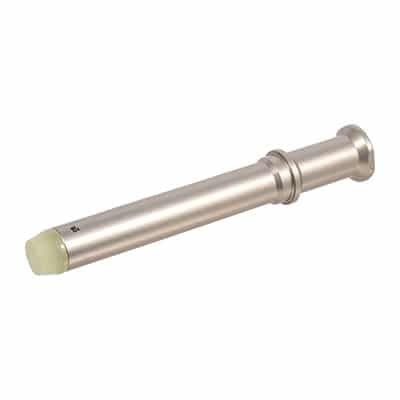 Although it may take some getting used to, it will greatly improve recoil over stock buffers and is immediately noticeable upon upgrade the extended length requires no spacer, which also helps to prevent bolt catch breakage. After equipped, you’ll notice it reduces the rate of fire for better control and less cumulative recoil. Seasoned gun owners who’ve replaced buffers in the past may be wondering if there are sliding weights for anti-bounce or dampening inside the buffer, and there is not. However, this buffer works very well as-is. All FM Product offerings are domestically produced in the United States from high-quality materials and the AR-15 FM-9 Heavy Buffer is no exception. It is a solid buffer that will last a long time. A heavier buffer may take a little getting used to for new gun owners, but the improved cycling and drastically reduced recoil make for a much better experience. While we’d prefer a warranty on this heavy buffer, the quality materials and superior USA craftsmanship make it a top choice. Since the buffer assembly is a mechanical part, it is necessary to periodically evaluate buffer spring lengths to ensure your AR-15 will continue to perform consistently. Standard carbine springs measure 10.5” and usually have between 37 and 39 coils. Rifle-length springs measure 12.75” and boast 41 to 43 coils on average. This spring usually is made of steel alloy and use a spring tension weight that is 10% over the standard spring. The spring shortens over an extended period. When you notice the carbine spring is less than 10 inches long or the rifle spring is less than 12 inches long, you will need to be replaced them. Rifle and carbine springs are NOT interchangeable. You should not ever consider exchanging rifle and carbine buffers. Ensure you have all the tools needed: You will need a castle nut wrench and your buffer kit. Your buffer kit should have a buffer tube, takedown pin, buffer retainer, end plate, castle nut, buffer retainer spring, takedown pin detent, and takedown detent spring. Thread your castle nut onto the buffer tube, being sure that it ends securely in place. Place your receiver end plate over the buffer tube. Be sure the bump on the end plate faces the receiver. This engages the cavity on the black of your receiver. Screw the buffer tube into the receiver a few threads, helping hold it in place. Insert retainer and the buffer retainer spring into the lower receiver. Push the retainer down and thread the buffer tube. It should hold the edge of the detent, allowing the tip to protrude. Insert the takedown pin, the takedown pin detent, and the spring. Now slide the end plate to the receiver. Be careful of the takedown pin detent spring. Tighten the castle nut to the receiver with your finger. Rotate the takedown pin until your detent falls into position. Tighten with your wrench, and you’re done! Enjoy improved recoil on your AR-15! By altering the weight of the buffer, you can modify the performance of how your rifle cycles. Finding the right buffer assembly and buffer weight will guarantee you'll be able to reduce felt recoil and recover more quickly between shots. Ultimately, you’ll be able to enjoy a better experience every time you use your AR-15.